A current trend among bloggers is the green smoothie. Kale + banana, spinach + strawberry, even dandelion greens + peaches. The smoothie aficionados swear that you don’t taste the kale/spinach/greens at all! Vegetables are some of my favorite foods. I say this with no sarcasm whatsoever. I like the taste of greens, thank you very much. I decided to take the concept of a smoothie — greens plus other healthy ingredients, puréed until silky — and translate it into a savory soup. A handful of basil and mint from my deck garden — more green! — adds to the sweet, summery goodness. If you have fresh peas, by all means use them; otherwise, frozen ones are fine. The result is as tasty as a great cream of broccoli soup without the cruciferous edge. A tiny amount of heavy cream elevates the richness without making the soup heavy. This soup is easily converted to vegetarian by using veggie broth and skipping the chicken; leave out the cream and feta and it’s vegan. I’ll try a vegetarian version topped with toasted chickpeas next. The large chunks of tender chicken breast do turn the soup into a healthy entrée, though. Best of all, this soup comes together speedily. It takes longer to prep the ingredients than to cook. In under half an hour, you have a lovely bowl of verdant, delectable soup. 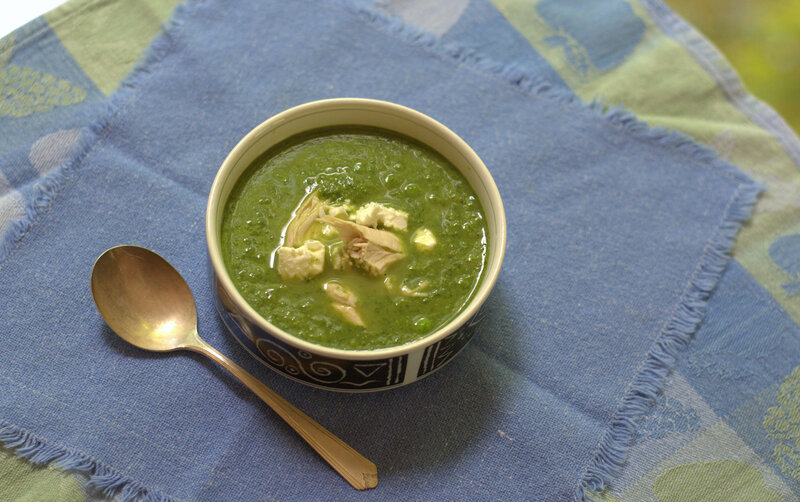 Feta offers a salty contrast to the mild soup but doesn’t overpower it. Shards of parmesan would also be lovely here. In a stockpot over medium-low heat, cook the onion, garlic and celery in the oil until tender but not browned. Season lightly with salt and pepper. Add the broth and bring to a simmer. Add 1 cup of the peas. Add a handful of the spinach, stir for 1 minute until wilted, and add another handful. Continue until all the spinach is in the soup and just wilted. Add the herbs and take the soup off the heat. Stir in the cream. Purée the soup, in batches if necessary, in the food processor until smooth. Pour the soup back into the pot; stir in the remaining 1/2 cup peas and the chicken. Taste for seasoning and adjust as necessary. Heat the soup over medium-low heat just until hot. Garnish with feta, if desired. This entry was posted in soups, vegetarian (or easily adapted to) and tagged basil, healthy, low-fat, peas, quick meal, soup, spinach, vegan, vegetarian. Bookmark the permalink.